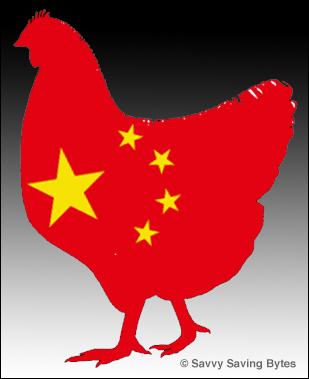 All the chickens will be raised and slaughtered in the US or Canada and because the chicken will only be processed in China, no country-of-origin labeling will be legally required. This convoluted journey raises still another red flag. The more food is fooled around with, the longer and more complicated the journey from source to plate, the greater the chance of contamination. And it’s hard to imagine chickens being raised in cramped, chicken factories in the US, butchered by the boatload and packed and shipped thousands of miles away, then shipped BACK again won’t be infected with troublesome bacteria somewhere along the way. Initially only four Chinese factories will have the honor of processing American Chickens. These factories were inspected by the USDA in March — SIX long months ago. AND that’s it! Not a single USDA inspector will check these sites during the actual processing. For anyone who has kept up with China’s alarming food scandals, this is not exactly thrilling news. This year alone, thousands of dead pigs floated along Shanghai waters, rat meat was sold as lamb, and ANOTHER bird flu virus broke out in their poultry markets. China’s dismal food manufacturing track record and indifference to food safety is well documented. (Meat that Glows in the Dark Perfectly Safe to Eat.) In 2008 six babies died and 300,000 were sickened (some with kidney stones) by milk contaminated with industrial chemical melamine. Add to that arsenic-laced soy sauce, plaster tofu, mushrooms treated with fluorescent bleach; bean sprouts tainted with sodium nitrite, fake wine, phony eggs and imitation fish. And let us not forget their ever resourceful use of “sewer oil” retrieved from drains beneath restaurants to recycle for the purpose of frying food over and over and over again. In a letter and petition sent to the USDA, Food and Water Watch stated that Chinese food safety measures were not up to US standards and our government’s primary objective was placating China into lifting their ban on US beef shipments, which went into effect in 2003 after a case of mad cow disease surfaced in Washington State. Right, and cows have wings. Sigh–yet another food to cross off my list of what I can eat. Horrible. Okay, so when I get hungry for meat I’ll come back and review this post! Here again it’s the processing that’s the killer. Looks like I’m going to start buying whole chickens when I’m in the mood for poultry, which hasn’t been for some time.